The Code of Practice (2015) makes it clear that provision for children and young people with special educational needs and/or disability (SEND) is a matter for the school as a whole. Every school should be continuously planning, teaching and assessing to ensure that all children and young people make progress, whatever their abilities, aptitudes and interests. All teachers are responsible and accountable for the progress of all learners in their class, including those who SEND and those who also access support from teaching assistants or specialist staff. When a school recognises that a child has SEND it must put provision in place to enable the child to participate in learning and to make progress. Many children with SEND will make good progress with “quality first teaching”. This means that their class/subject teacher makes changes in the way that he/she delivers the curriculum so that the child with SEND can be included in the lesson. A small number of children may be identified as requiring further SEN support. This means that they require support or interventions that are “additional to and different from” the support that other children in the class require. If a child is identified as having difficulties, parents will be fully involved throughout the graduated review process. This may include discussion with the class teacher or SENCo and attendance at meetings. Teachers are continually assessing, planning, implementing and reviewing their approach to teaching all children. However, where the teacher identifies that a child has SEND, the graduated review approach is implemented specifically for that child. For a child who may require SEN support, individual assessments will be completed to more clearly identify need. Personalised interventions will be planned and implemented to address those individual needs. Finally, the interventions will be evaluated through an individual review of progress. This process should be repeated on a regular basis and should involve the child and their parents/carers. • What changes or adaptations to day-to-day class/subject teaching they need to make. A small number of children, who continue to struggle despite assessment and intervention, may require specific SEN targeted provision. This is provision that is “additional to and different from” that made for the majority of children in school. It will be a specific SEN intervention program that is known to be effective by school. It could also be a programme that has been shown through research to be effective. When school plans targeted provision there must be clear and expected outcomes linked directly to the provision. Extra support from an adult. The SEN support provision will be put in place for an agreed period. It is important that the SEN support takes place regularly and consistently and that accurate records of that support are kept. During this time it is important that teachers work closely with teaching assistants or other specialist staff to monitor progress. This should take place regularly. should be no different for children with SEN. It is not necessary for teachers to wait for formal review meetings before reviewing and, if appropriate, making changes to teaching approaches and other provision. However, the SEND Code of Practice states that progress towards meeting planned outcomes should be tracked and reviewed at least once a term and the outcomes of the review should feed directly into the next planning phase of the graduated approach. • Has the child achieved the agreed targets? • What is the evidence from day-to-day intervention tracking? • Are the skills acquired through targeted support transferred back into classwork? • How have the child and parents responded to targeted provision? • What are the views of support staff, parents and the child? • How will the outcomes of this review inform the school about the child’s needs? • What changes to support, provision and targets are needed? 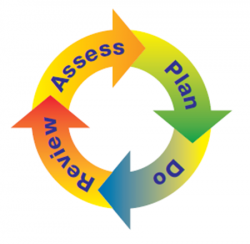 The assess, plan, do, review process is a cycle – the idea being that this process is continual. If the review shows a child has made good progress, this may mean they no longer require the additional provision made through SEN support. If this is the case, the child will no longer be identified as SEN support and, instead, will be monitored to ensure progress is sustained through inclusive high-quality teaching. The child, parents and carers should be involved at each stage of the graduated approach. They should be informed if the school has concerns about progress and if the child is identified as requiring SEN support. Child and parent/carer views should then be part of all elements of the assess, plan, do and review cycle. Involvement of the child and parent/carers will also enable the family to share agreed strategies in supporting the child which may also be implemented in the home.